This is the next piece in the 10×10 series by the innovation firm Method. Read the previous pieces and more about the series here. A pugnacious CEO once told me that there are three ways to lose money: gambling, divorce, and innovation. With annual U.S. research and development spending amongst Booz & Company’s Global Innovation 1000 at over $500 billion, companies are paying heavily for the ambition to create. But how do you plan for new growth and innovate in those markets where too many businesses are armed against commoditization with glib value propositions and over-reliance on cost containment, promotions, product extensions, and price competition??? According to a global study by IBM, today’s CIO spends an average of 55% of his or her time on activities that spur innovation, and the key component underpinning all successful innovations is the business model. For a business model to be of value, it must have three core elements: a unique central idea that defines who you are, a grasp of future market trends, and profitability from either lower cost base or an offering that cannot be easily copied. An example is Gilt Groupe, whose business model covers all three, and has allowed them to continue to innovate across several categories. One of the hottest startups in New York, they expect to generate up to $500 million in revenue this year, up from $170 million in 2009. “?Implementing a differentiated business model can successfully unite silos across the enterprise, turn around opportunities faster, get customers to stay longer and pay a premium, resolve internal crises quicker, and better leverage the allocation of resources. Nice to have, but where do you start” The solution is a combination of insights from Booz & Company, Michael Porter, and Philip Kotler that blend into a six-step process that can guide organizations to conquer the challenge of building a business model geared for innovation and business transformation.?? Technology Drivers, such as Facebook, who is constantly rolling out new releases, seek to solve the unarticulated needs of customers via new technology.?? Identifying which approach is relevant for the business model has huge implications for the outcome of the innovation process and the allocation of resources.?? Consequently, it is essential to become the ruthless enemy of ambiguity and ask entirely different sets of questions about the business: how will you innovate and evolve the brand? 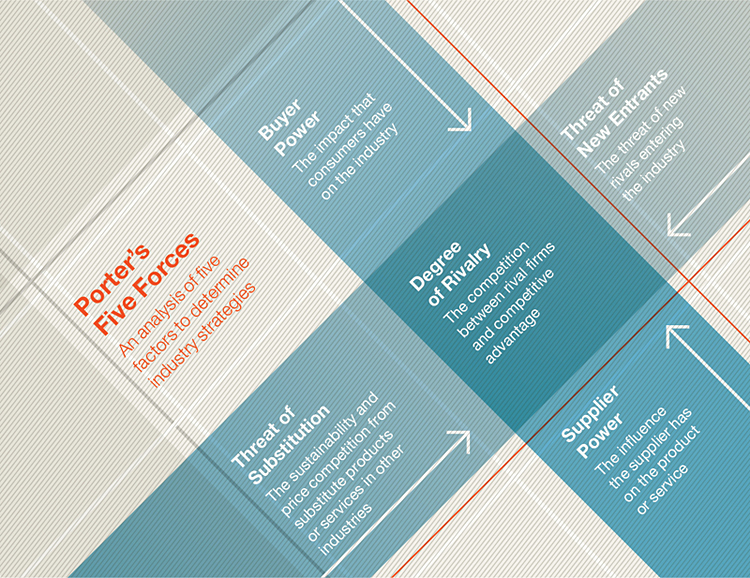 An excellent framework for analysis can be found in Michael Porter’s five forces: the degree of rivalry in the category, threat of new entrants, the chance of substitution, buyer power, and supplier power. In basic terms, the framework requires that an organization evaluate their strategic position relative to the forces. By understanding influences such as competitive threat and supplier bargaining power, a business can generate an edge in the category.?? Behemoths like McDonald’s, PepsiCo, and Amazon are thriving global businesses because they fully understand the dynamics of Porter’s five forces and have successfully adapted their business models to influence the category in their favor. Price: What must be set to cover fixed and variable costs with a just profit? Place: Where have you chosen to do (e)business and why?? Promotion: How do customers buy similar products and how should you sell?? Performance: What are the key metrics against which success will be judged? A robust plan must also layer in government regulations and laws currently in the market space ? an essential component often overlooked. “When evaluating countries for investment or opportunities, look first at a country’s geopolitical stability and its laws protecting property rights: these issues tend to provide a better long-term view on market risk and opportunity than economic indices,” says Dr. Alan Greenspan, former Chairman of the U.S. Federal Reserve??. 4. Lead, Follow or Get the Hell Out of the Way?? 5. Big Results Require Big Ambitions? ?According to McKinsey, 84% of executives believe innovation is extremely important for their company’s growth strategy. However, the successful implementation of innovative products, services, and experiences is a road paved with strain and failure. While building the business, do not let short-term growth override the long-term vision. This approach separates immediate appetite from real business requirements, providing a strong, steadfast strategy to move forward. Facebook has built an unrivaled network of highly engaged users, allowing them to share information with their friends. From this powerful network and content sharing mastery, Facebook has also been able to create a standard for single sign-on and open applications. Google encourages big ideas in compact time amongst its engineers, giving them one day a week to work on a side project. It has been tremendously successful, yielding more than half of the company’s new offerings in a typical year! So, whether it is busting a new category or pushing the boundaries of the establishment, people are organized and compelled by ideas that have a clear strategy, form, and expression.?? With the 21st century on fast forward, never has there been a more important time to innovate in the face of new faster global competition. Entire new industries and many existing ones have transformed to become creators of valuable ideas and experiences. Increasingly, civilization is organizing itself to maximize the generation of new and better ideas, creating the infrastructure, education systems, and innovative organizations that will solve problems, create value, and change the world. This six-step process helps businesses differentiate in crowded markets and positions them for successful implementation of innovation. So let us say yes to delighting customers and celebrate imagination and indefensible creativity to advance humanity into a brighter future. Method is an award-winning, international product, service, and experience innovation firm. 10×10 is a series of thought pieces written by Method that explores 10 emerging, industry-challenging topics. Read more about 10×10 here.